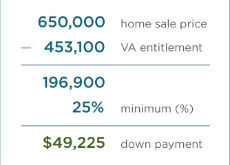 Refinancing existing VA Jumbo loans in Texas into a fixed-rate loan, a lower interest rate or shorter loan term without taking additional equity out of the property is also possible thru the VA Interest Rate Reduction Refinance Loan (IRRRL). Non-veterans are not eligible borrowers for VA Jumbo loans in Texas except as the spouse of an eligible veteran. Grab the Opportunity to Use VA benefits to get VA Jumbo loans in Texas. Whether you are considering purchasing or refinancing an existing VA Jumbo Loan, Clear Lending can help you. Simply complete our secure and encrypted Pre-Approval Form online and we will contact you right away to review best options for you regarding VA Jumbo loan terms.